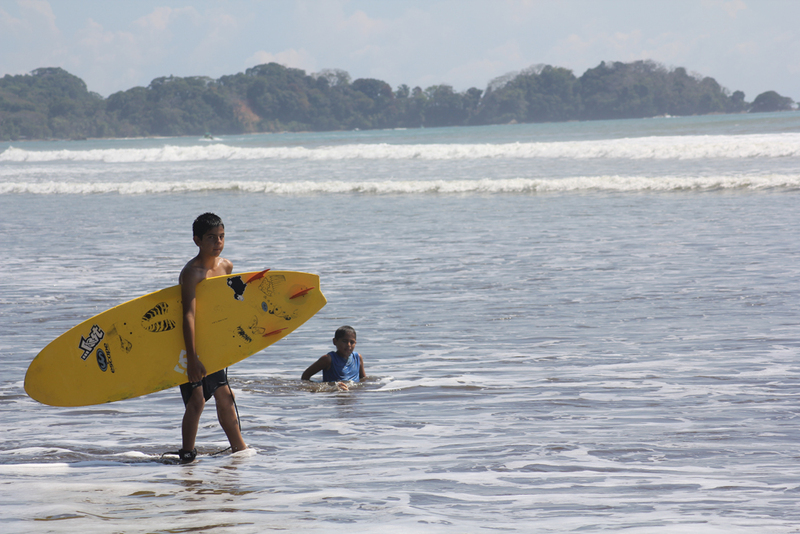 Because of the geographic location of Costa Rica the country is a surfers paradise. 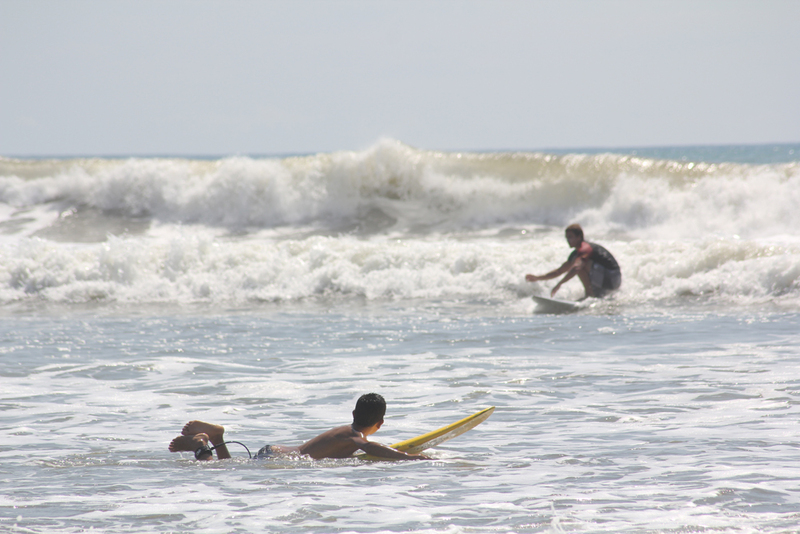 In big parts of Costa Rica theres a lot of surf and many coastal towns spread the surfers vibe. 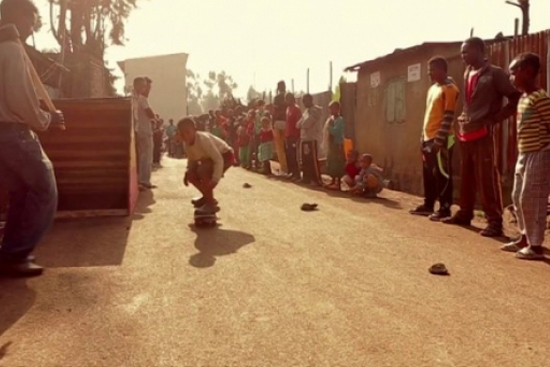 Since surfing and skating are historic related the trip was not all about experiential education. I wanted to clarify the reference between these two subcultures and give the kids an idea of the history of skateboarding. But more then everything else the kids should experience something what was out of their routine life. 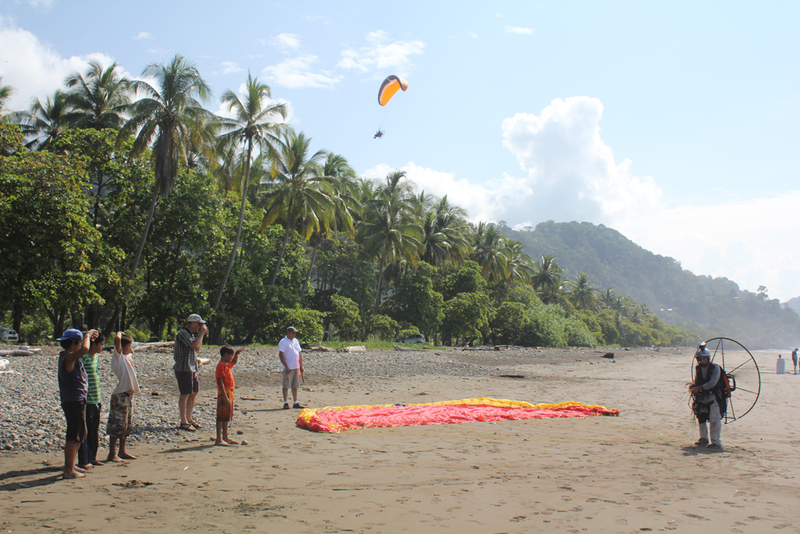 San Isidro is situated in the south of Costa Rica but not at the coast. So the first thought was which beach do we choose. 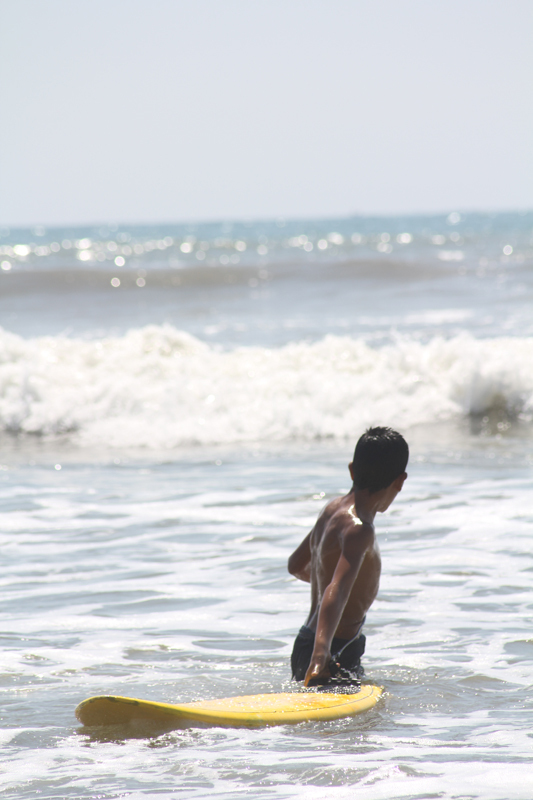 I decided to pick “Dominical” a village located at the Pacific Ocean 35km away from Perez. The village seemed perfect. 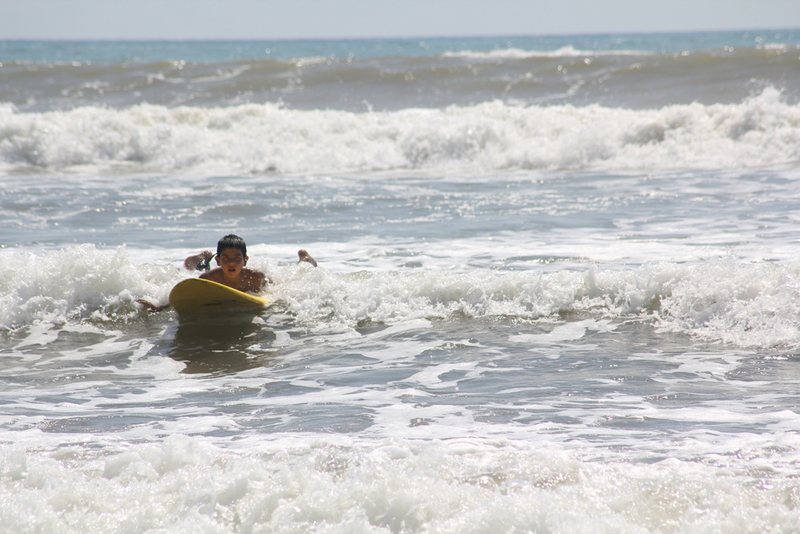 All around the year the beach of Dominical catches waves and is a famous surfing destination. After we found the right spot we had to purchase the money for the trip. 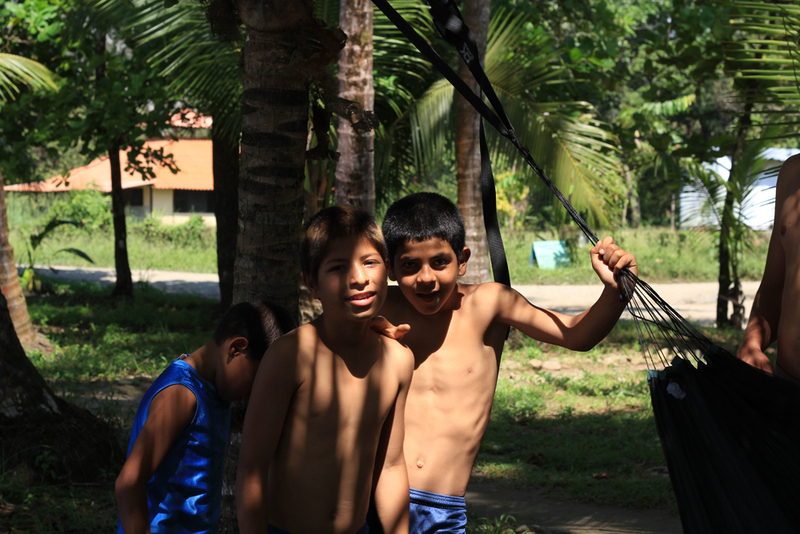 Most of the tic@s within the Pura Vida project came from poor relationships and the families could not afford a trip like this. 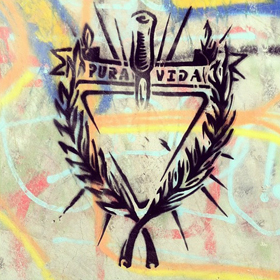 The Costa Ricanean organization Vida Nueva did not have sufficient credibility either. 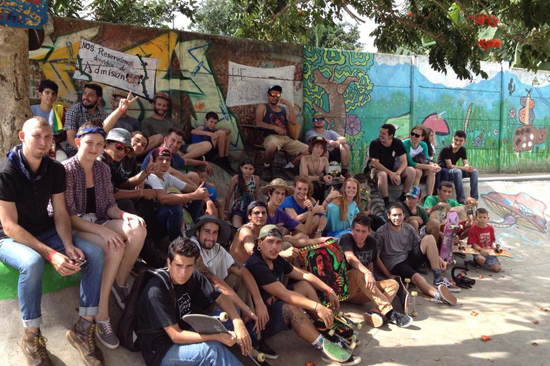 But because of the cooperation and financial support of the Titus Dittmann foundation Skate Aid we were able to realize the project. But still we wanted to keep the costs as low as possible to have enough money for other ideas. The transportation was easy to manage. To get to Dominical we used “Schalke”- a car which Barney and I bought a couple of month before. “Schalke” is a Hyundai Excel, model year 1990 who served us great through the country and this time he would not let us down either. Next question, where do we sleep? A cheap solution and at the same time an experience I planned to camp right at the beach front. 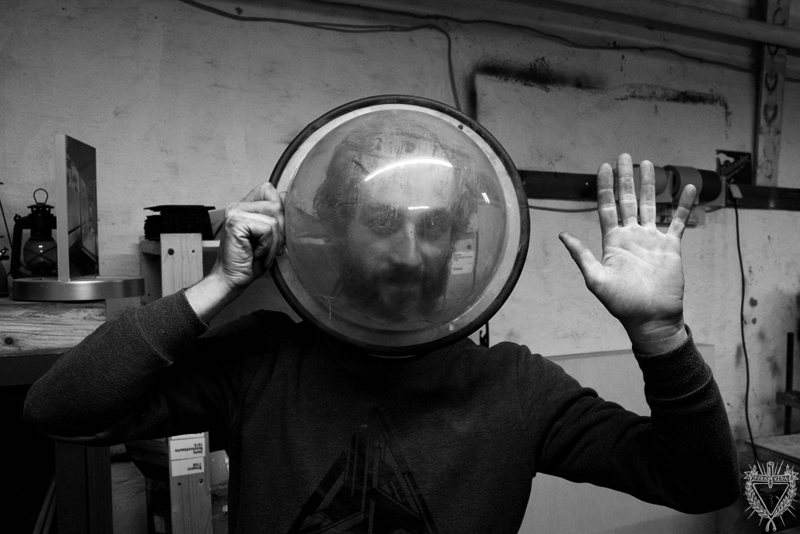 I hoped to make clear the reference between nature and surf culture and create an atmospheric setting. Because of the lack of time one night per camp was the maximum stay we could manage. 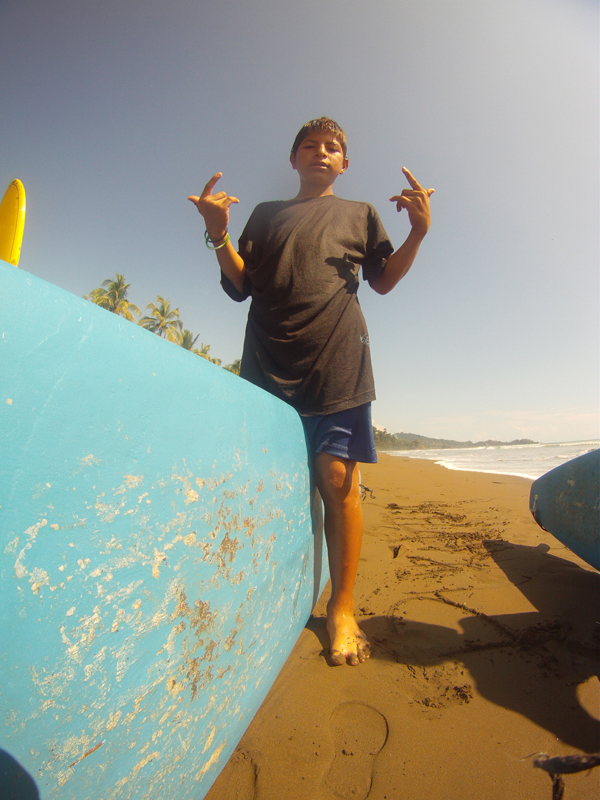 During earlier weekend trips to Dominical I was able to make friends with the owners of a hostel. After I explained my request we had the permission to use the toilets, showers, the kitchen and some rental boards. Even the location of the hostel was perfect, right in front of the beach and not far away from the camp. Again a huge shout out to Sri and Celine… Thank you Cool Vibes Hostel! 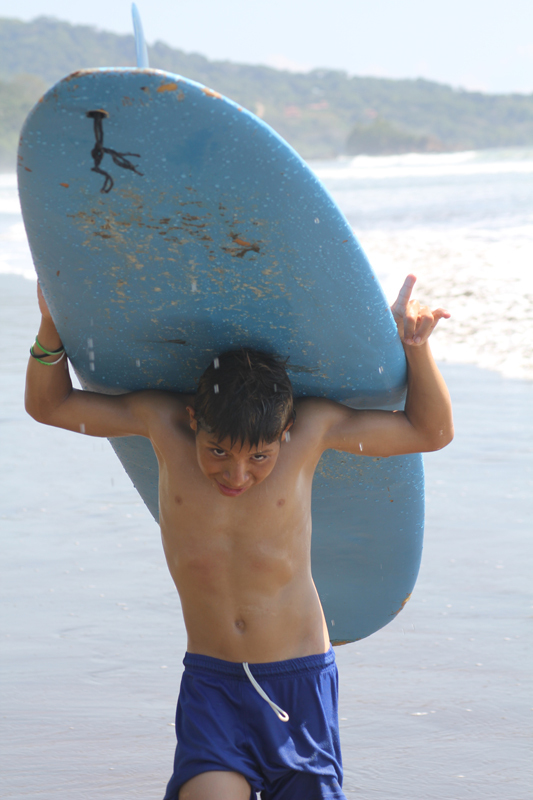 In advance I decided to offer the surfcamp for the kids between 10 and 15 years. Like I already said it was one of my last projects and during that short time I was only able to organize 2 surfcamps maximum. The numbers of kids in that age group were 13 in total. But a group of 13 kids are quite hard to handle and in the water it would be way too dangerous. So the only possibility was to form 2 groups and do 2 trips with some space between each other. The groups should not exceed 4-5 kids and three guardians should provide the necessary safety and instruction. Surfing goes just like skating hand in hand with some risks. 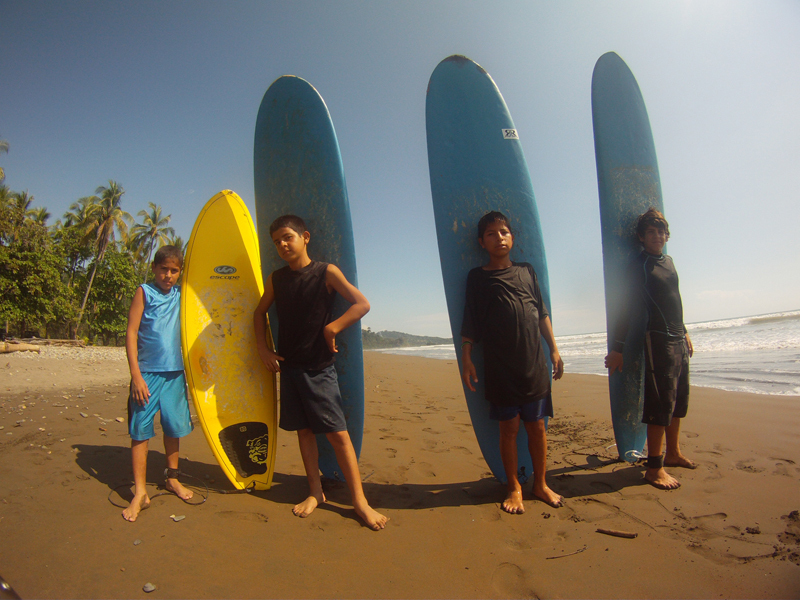 The surfboards are hard and especially longboards which you need for learning are huge and heavy. If your board hits you uncontrolled it can cause injuries like bruises or lacerations. 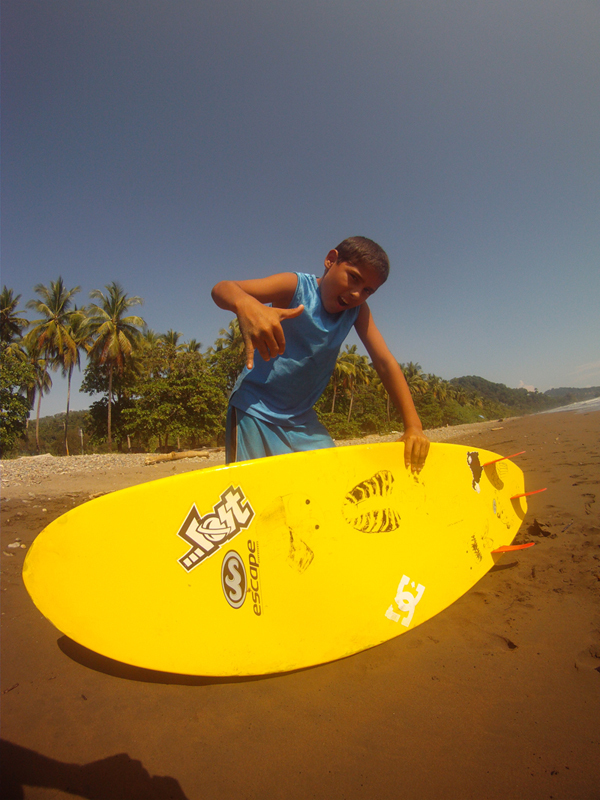 Another risk in Dominical is the current. Depending on the tide, rip currents can occur. 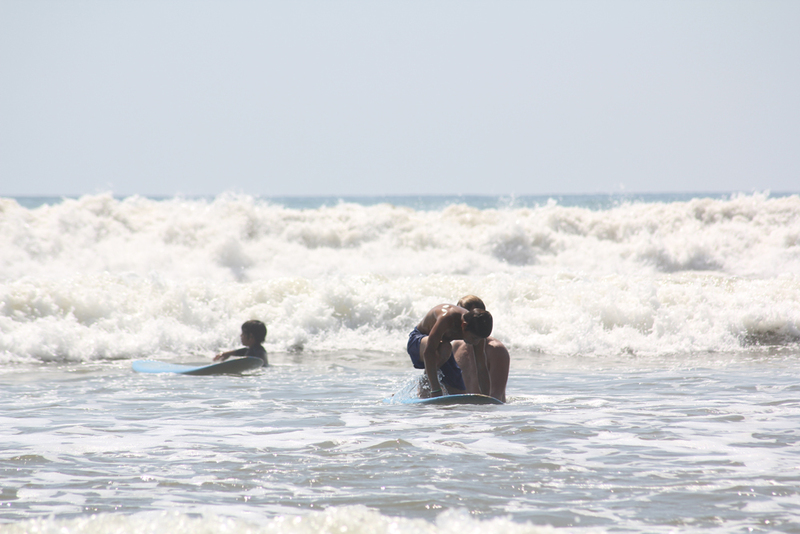 And sometimes they can be so strong that they drag out bathing people and surfers. Having these risks in mind it was totally necessary that the kids were in a good shape and good swimmers. Also the number of the instructors had to be quite high to take care and be alerted all the time. Because of these risks we decided to talk to the parents personally. After the planning was finished and we presented the idea and concept to the kids I took care of the Parents interviews myself. I wanted to reduce their fears, give them an idea of the trip and cover our area of responsibility. Every interview was different from each other. A lot of parents were enthusiastic about our plans and gave directly their permission. Others were skeptic and only after long conversations I was able to win their confidence. During some of the interviews I found out that a few of the kids could not swim at all. Unfortunately these kids could not join the trip. For the new volunteers… organize swim lessons! After the interviews we separated the tic@s in two groups of three and four kids and announced the meeting place and time. 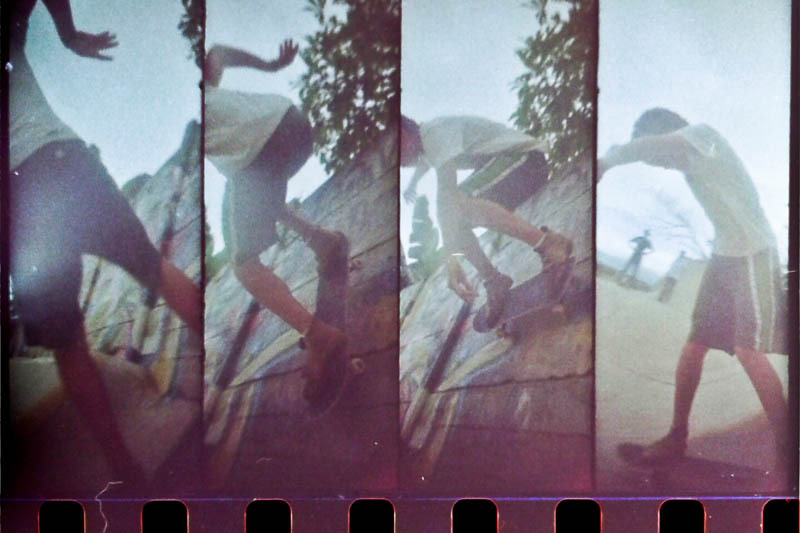 The spot to be was like so often the skatepark in the early morning hours. The trip towards the beach was totally uncomplicated. All of the kids and one driver came by car and two other adults by bus. While driving the kids were already euphoric, nervous and really excited for the beach. 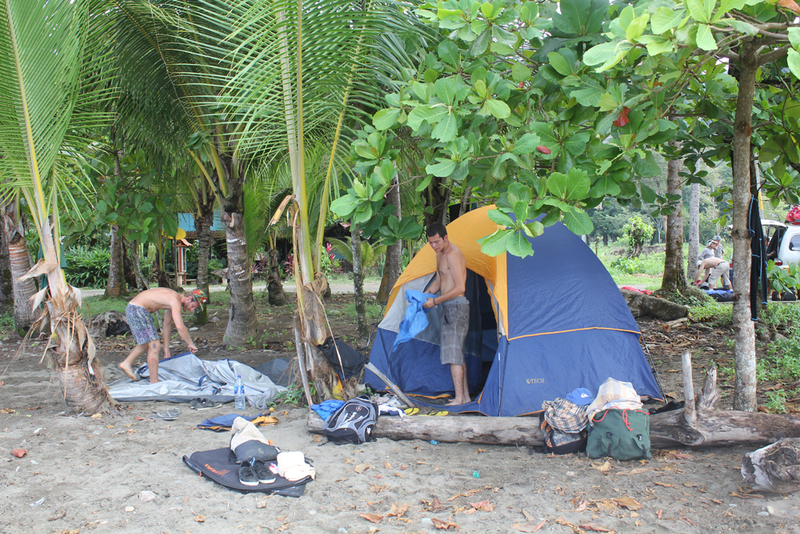 As soon as we got to Dominical we set up the tents. 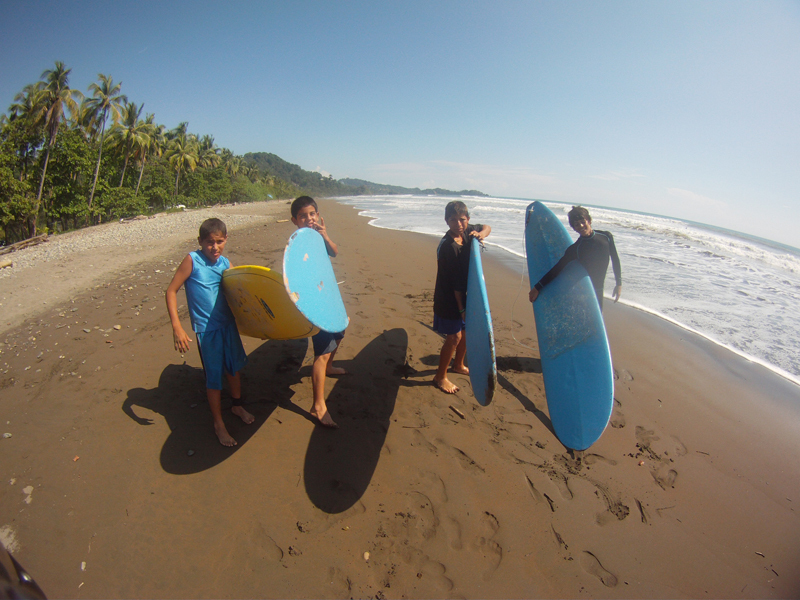 Afterwards we showed the kids the area, the sanitary facilities and fetched the surfboards. First we had to clear the safety precautions the behavior in the water and the procedure when a dangerous situation would approach. 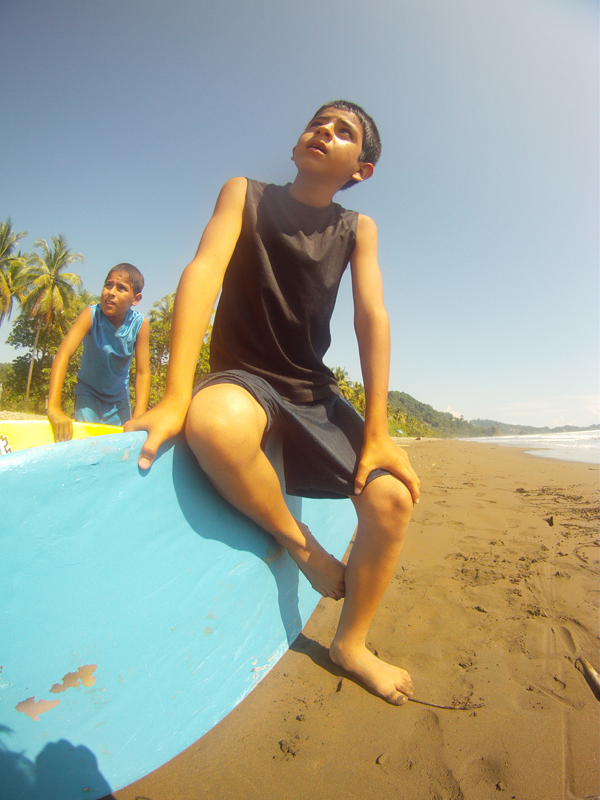 Just then we explained how to surf and showed them on the sand how to stand up. After a little warm up we entered the water. Barney, Burro, Zoe and I were all the time right next to them pushed them and if something would have happened we would have been right there. The tic@s progressed really fast and after a while they were all able to stand up and surf the whitewater. Sometimes they would change boards so they could try smaller and bigger ones. The highlight was a proper drop in the green water by Estephan. After 2 ½ hours the kids and the adults were totally exhausted. 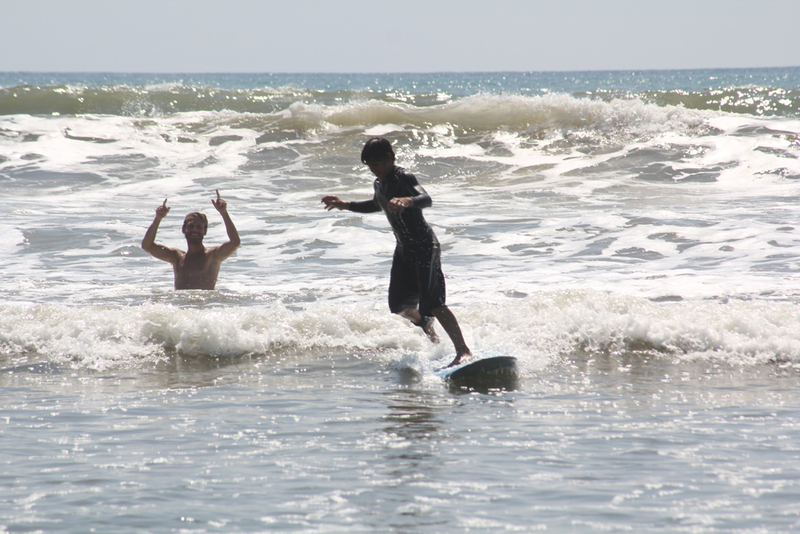 Standing in the water without board and being pushed around by the current was just as hard as surfing. So we exited the water rested in the shade of the palm trees and shared our lunch together. But after some minutes the kids were already recovered and searching for more action. We brought away the boards and went towards a beautiful waterfall named “Poso Azul” with a nice little swing right into the cool water. There we finally found our rest but the tic@s used the Tarzan Swing like there would be no end and it kind of felt like they would enjoy it more than surfing. As we got back to our camp we started preparing our dinner. Pasta with a good and solid tomato sauce was just perfect after a day like this. But still after dinner the kids were far away from being tired and willed to skate the miniramp at the bar “Tortilla Flats”. The tic@s did not mind a big hole in the flat just skated around it and were killing it. But after 2 hours even the kids were tired and we went back to the camp. We completed the day with a bonfire at the beach, a reflection of the day and a little retrospection of the surf and skate culture. After a good sleep we started early in the morning with some sandwiches. We asked the kids what they wanted to do since we had some hours left before leaving. Of course they wanted to see the waterfall and especially the Tarzan Swing again. Before noon we left Dominical for San Isidro. Everything went smoothly and no kid got hurt. The tents were dry during the night and the entire trip was absolutely successful. 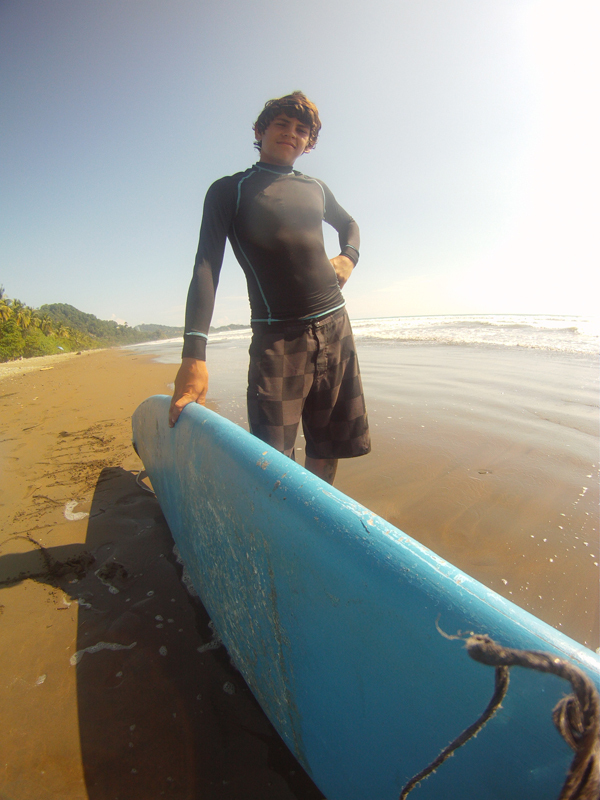 After my time at Pura Vida I think the surfcamp was the project that I will keep in mind the best. 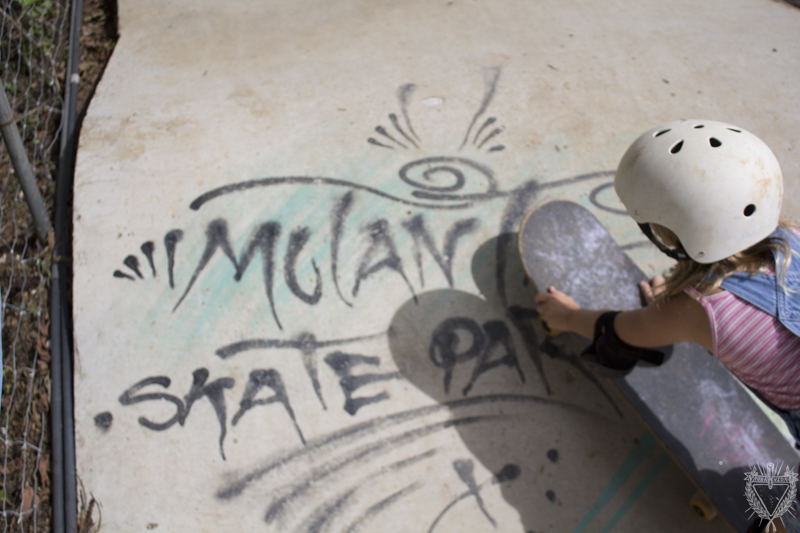 With a minimal budget we were able to offer the kids such an experience and show them a new and beautiful subculture. Also the interviews with the parents turned out to be an enrichment for the whole project. Not only fears and doubts were relativized but we build a connection to the parents which can be really important for the future of the project. During the whole trip I witnessed a really harmonic interaction between the kids and between the adults and kids. The kids learned fast and consolidated their self- confidence and the dynamic of the group. 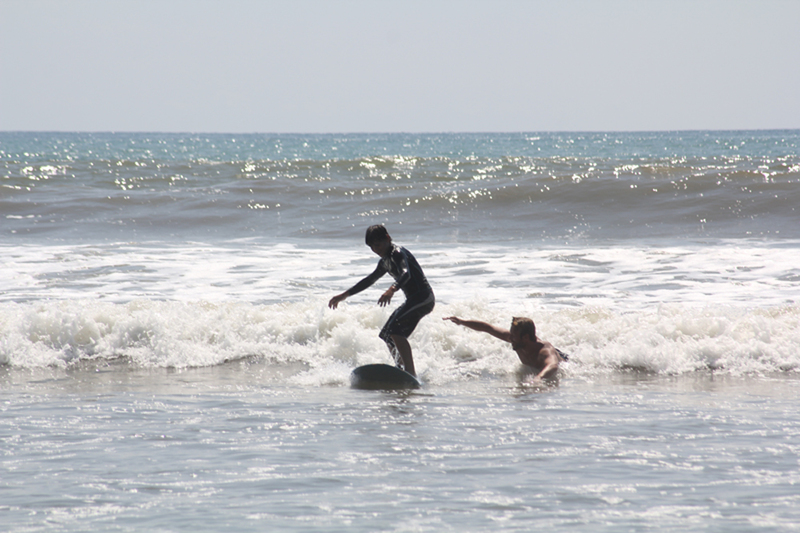 For an experiential education experience a surfcamp is perfect if you work with kids. In the end I´m really glad that I took the risks and did the trip. 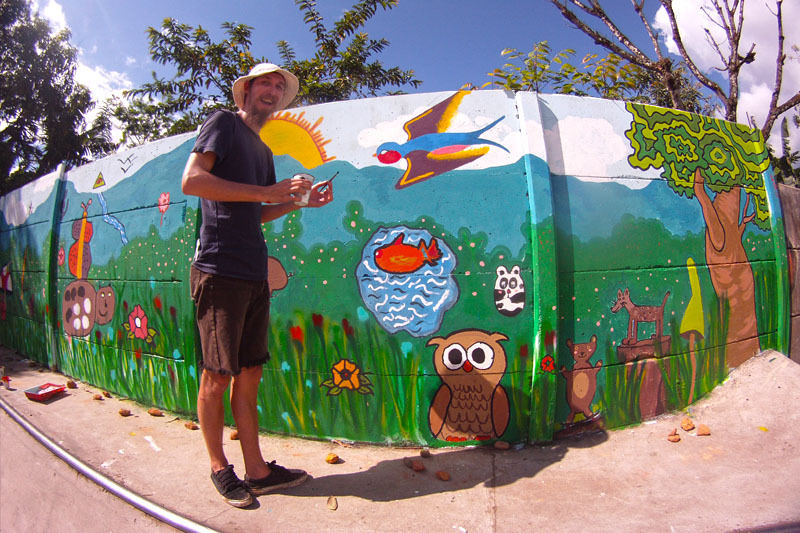 Thanks to Barney, Burro, Zoe, Sri, Celine and everybody who supported Pura Vida. You made that trip happen!